I've been in Melbourne for almost eight years now and it's about time I picked an AFL team to support. American here, looking for a team to cheer on. All that is good advice but I think there's a quicker and easier way for someone like me to choose a team: using the power of brands and brand association. 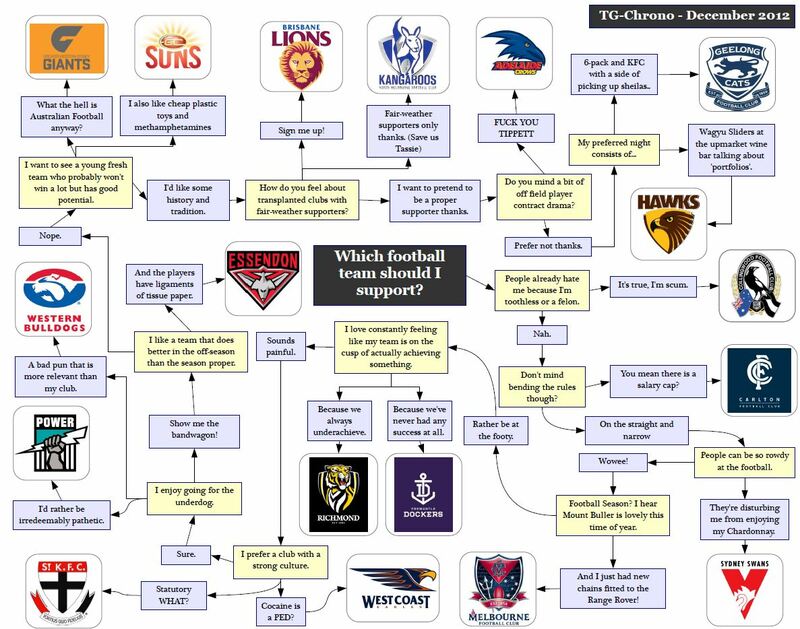 So, if I was to choose a team by brand association alone, then the team I'd be supporting is the Sydney Swans, with the Brisbane Lions coming in second. The brand I like the most from that list, by the way, is iiNet, which is a Hawthorn partner. But the brand like the least is Swisse, which is also a Hawthorn partner. So those two pretty much cancelled each other out. Oh well. So, there you have it. After living in Melbourne for almost eight years I now tentatively support the Sydney Swans. Go figure. Now that I've reached a tentative result, I need to research the Swans and watch some of their games. If I'm going to support them seriously I need to know much more about them. I need to learn about their players, their coaches, their history, and so on. I'll now keep an eye on them and report back if all is going well and if I'm going to continue to support this team.